Is your metabolism running full speed ahead? Do you have a sticky metabolism gas pedal? Daily energy levels are controlled by a variety of hormones and organs in your body. One vital component to your metabolism is your thyroid gland. If your thyroid function is sluggish or overactive it will negatively impact your life. The thyroid plays a huge role in breathing, blood circulation, body temperature control, digestion, bowel movements, muscle control and even brain function. Symptoms of thyroid problems can overlap between hypothyroidism and hyperthyroidism and can include thinning hair, dry skin and temperature sensitivity. This body system is one of the best examples of the body-brain-gut connection. The pituitary gland in your brain secretes a hormone for control of thyroxine (T4) production at the thyroid gland. Next a number of body systems and organs convert the T4 to triiodothyronine (T3). Hormone levels are controlled as part of a continual feedback loop. Hypothyroidism is often a multi-faceted problem. Your body may not have enough of the hormone to fuel your body’s metabolism. Another component of this disorder is the challenge of converting the base thyroid hormone T4 to the workhorse T3. Many organs and systems are involved in the conversion process. 60 % of the conversion occurs in your liver. The next largest contributor is your digestive system with another 20 % of the conversion occurring in your small and large intestines. The last 20 % is converted in other body tissues such as your heart, skeletal system, other muscles, fat cells, and the glial cells of your central nervous system. You might be wondering if your body has so many ways to complete the conversion, why is there a problem? The answer is chronic inflammation. Inflammation is often caused by autoimmune diseases like hypothyroidism can handcuff any organ or body system from working up to its full potential. Traditional Chinese Medicine (TCM) is all about balance. Both over and under active thyroid conditions highlight a body out of balance in need of restorative treatments. The goal of TCM is to nourish and support the body. You gain nourishment through the foods you eat and the herbals you use. Acupuncture treatments provide underlying support. Your endocrine system is derived from the yang energy of the kidneys. Energy is stored in our kidneys, and they are in charge of the energy of our will power. Early TCM practitioners understood this energy storage systems and by extension, the hormones that affect your overall energy level. My approach, first and foremost is to focus on a patient’s GI tract. We get new energy/qi from what we eat, breath and drink. Therefore it only makes sense to improve every part of digestion from initial intake to distribution, uptake and final elimination. Once the GI system is stable and productive we can move on to build the kidney energy. Think of your body’s energy system like a rechargeable battery. Acupuncture treatments keep your energy flowing and also restore the charge, keeping everything in balance. The duration and severity of your health issue also contribute to the timeline of your healing and restoration. Often there is not a 1-to-1 correlation. Remember that additional factors come into play as well. Your age, your overall health, and especially in the case of thyroid disease, how much tissue damage has already occurred will all affect the progress of your treatment. 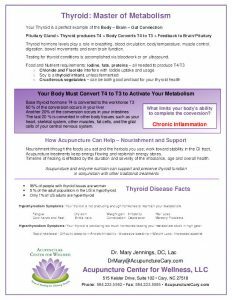 Acupuncture and enzyme nutrition can also be used to support and preserve thyroid function in conjunction with other traditional treatments. Download your copy of Thyroid: Master of Metabolism Handout from our recent Meetup group event for Thyroid Awareness Month. A diagnosis of hypothyroidism means that your thyroid is not producing enough hormones to maintain your metabolism. On the other side of the spectrum, a diagnosis of hyperthyroid means too much hormones leaving your metabolism stuck in high gear.